I am such a chocolate addict. Really. I could have chocolate every single day without complaining. I think I pass that addiction to my little girl too. While she won’t care about candies or cakes too much, chocolate is everything! It is hard to be a mum and teach them what is good for them. I can’t hide from my kids to enjoy my chocolate secretly – hum, wait I could – but this is not the best thing to do. So instead I choose balance. We do indulge on sweet treat or chocolate sometimes. But I buy the most nourishing ingredients. The one that are actually good for our body. While we were both browsing the aisle of our favorite supermarket, Emma asks for chocolate milk. It seems to be a very trendy ‘thing’ among her friends right now. We looked at all the options in the store – even the dairy one as it was for her. Most brands contains around 10 g of added sugar per 100 ml in their milk. It does not look huge but when you know that one serving is at least 250 ml it easily raise your kids sugar intake to 25 g of sugar. Should I remind us mum that a 4 year old intake should not be more than 16 g of added sugar per day ! Whatever, Emma knows that mummy is not very keen to buy sugar loaded or over processed food. As we recently learnt about reading food packaging to spot healthy food looking at their stars rating, I encourage her to keep looking in the store until she find something healthy. She finally, spotted the dairy free Almond Breeze Chocolate Almond Milk – – made by the almond experts in California. This Almond Milk is having 4 health stars so I was super excited about it ! You guys know I only drink dairy free milk so I was very happy that she spot one we could both enjoy. We looked at the nutrition panel and what a lovely surprise ! With only 6 g of sugar per 100 ml, a large packaging that I could use in smoothie it was our best deal. 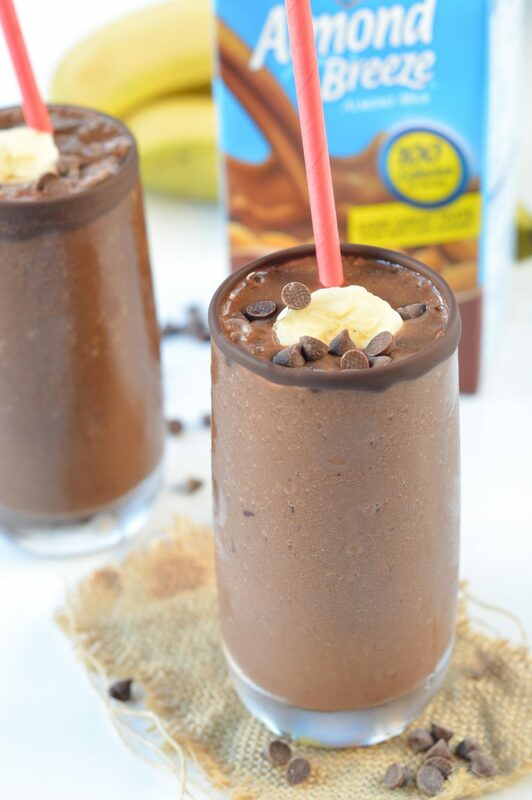 WATCH THIS HEALTHY CHOCOLATE BANANA SMOOTHIE RECIPE VIDEO ! So we came back home and made a lovely thick healthy Chocolate banana smoothie. 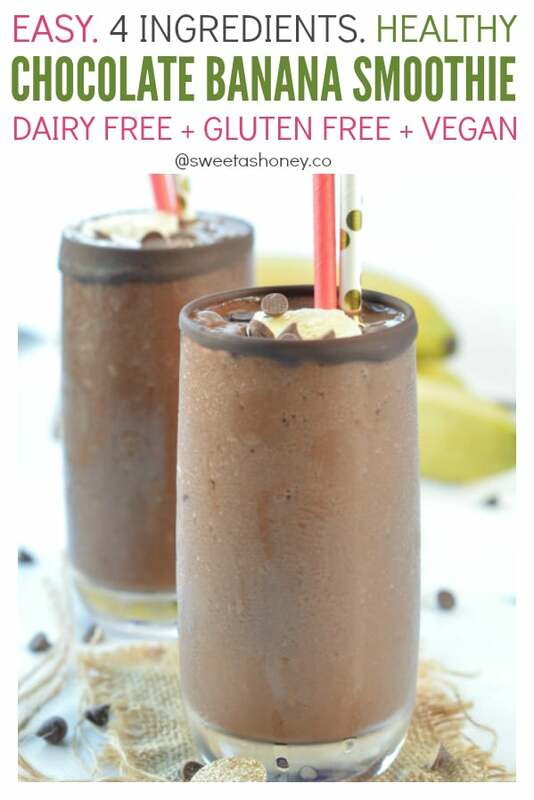 We used 1 cup of Chocolate Almond Milk to keep the added sugar low, raise the sweetness with frozen bananas and hide few baby spinach leaves inside. It is optional but why not raising your green intake while enjoying a treat ? 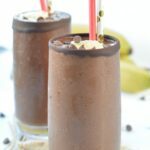 More than a smoothie, this chocolate banana smoothie with Almond Breeze Chocolate Almond Milk taste like a dessert. It is very sweet, thick but light on your tummy ! Well, no surprise as it is dairy free ! This recipe serve 2 adults or 4 kids. One kid smoothie contains 5.5 g of sugar – only 3.7 g of added sugar from the milk ! It was really the best comforting chocolate treat we made together.Enjoy ! 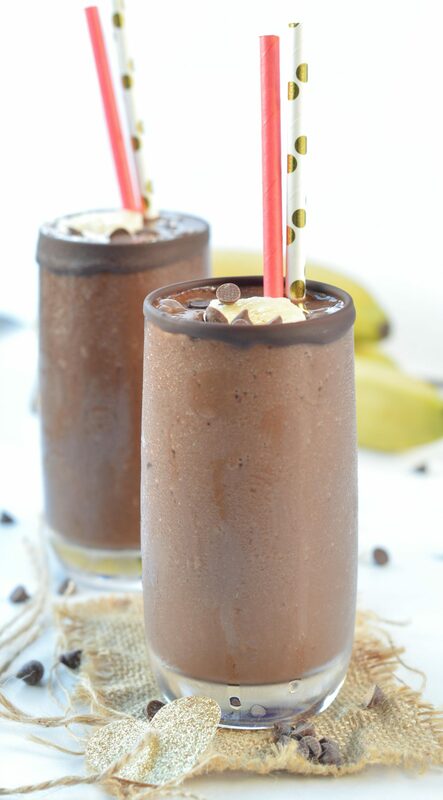 This Healthy Chocolate Banana Smoothie taste like desserts. Thick, dairy free smoothie using light almond milk and unsweetened cocoa. A great guilt-free chocolate treat to maintain your weight loss goals and fix your chocolate cravings. 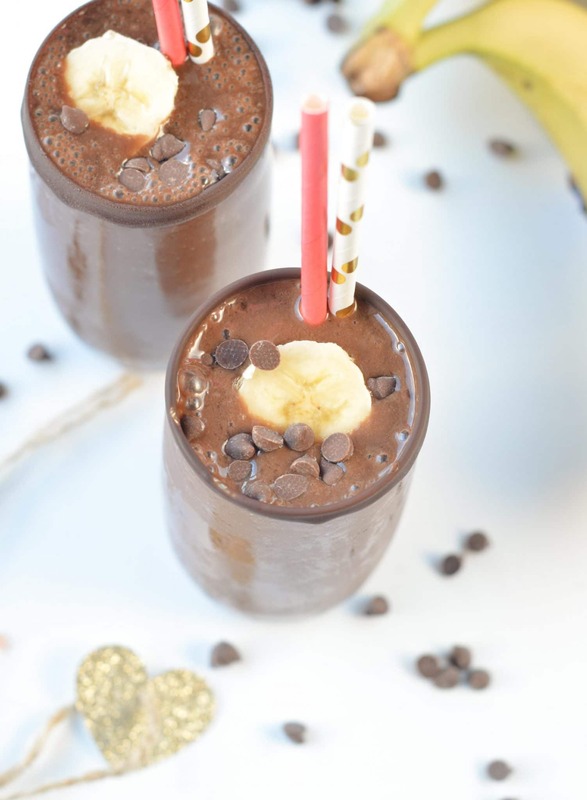 In a blender add the chocolate almond milk, unsweetened cocoa powder, frozen banana slices and baby spinach. Nutrition panel is for one adult smoothie. This recipe serve 2 adults smoothies or 4 kids smoothies.